Following other blogs is a big part of your life as a blogger. Just think of the inspiration, context, camaraderie and collaboration opportunities they offer. But how do you keep up with them? 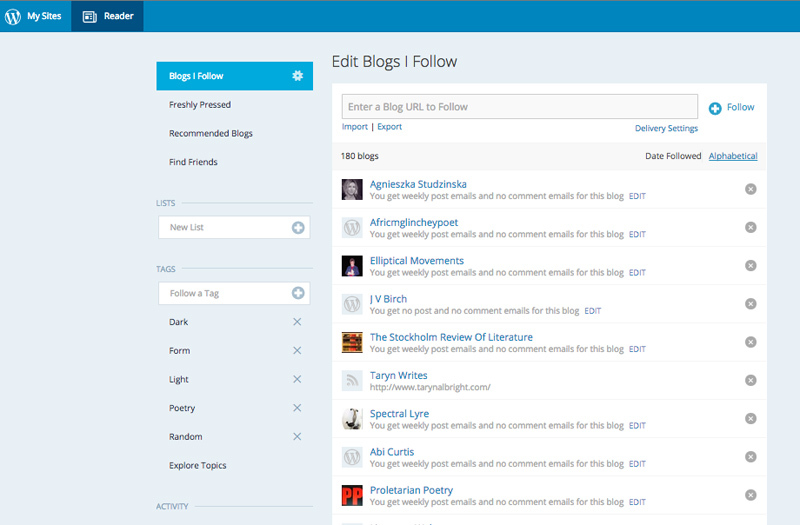 Do you use a feed reader, or hear of new posts via email, for example? 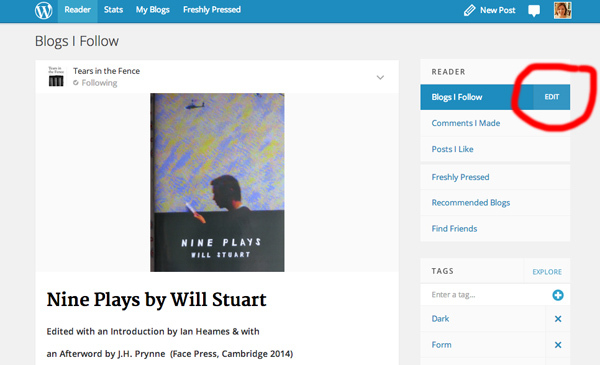 Because I blog using WordPress I’ve always found it easy to just hit the ‘Follow’ button on another WordPress site, and have the blog added automatically to my WordPress Reader. But for non-WordPress blogs, it’s not quite so easy – you have to copy and paste a blog or feed URL manually into your WordPress reader. 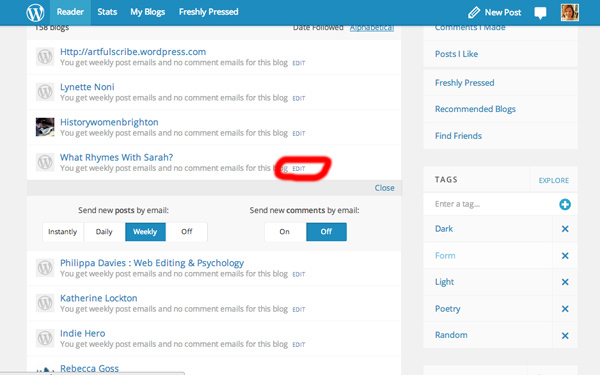 Also, with WordPress blogs, I have the option in my Reader to get a weekly email digest of new blog posts. This means every Monday morning I have a dozen or so alerts, and I can skim through them at the start of the day. But more than a dozen at a time would be too much for my inbox (or my Monday morning brain). 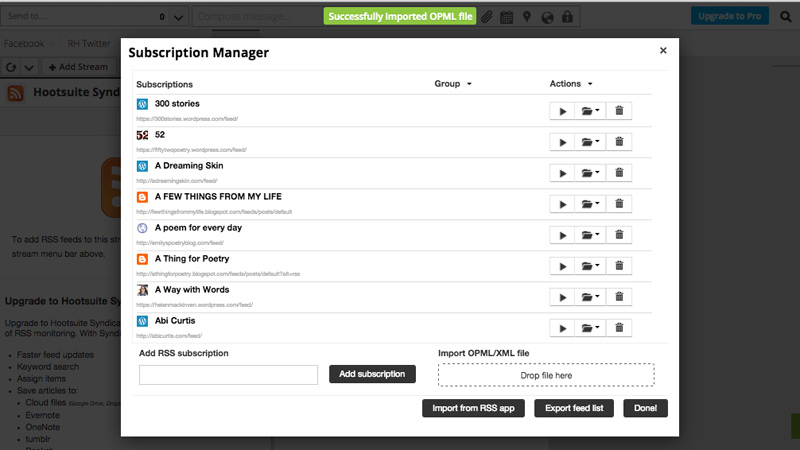 And I don’t have this email option for non-WordPress blogs I subscribe to in Reader. 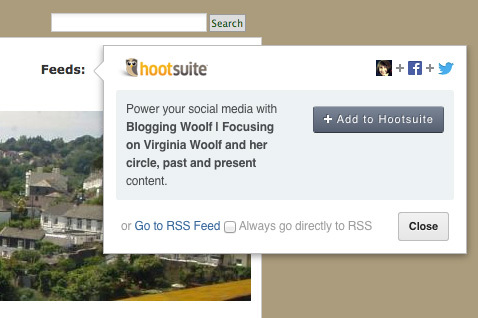 However, I recently took the plunge and decided to add all my blog subscriptions to my Hootsuite dashboard. I’d been putting it off because it wasn’t a high priority and I imagined it might be more complicated that it turned out to be, but I needn’t have worried. So if you’re in a similar position, here’s a step-by-step guide to moving all your blog subscriptions to Hootsuite, so you can view blog updates anytime alongside your other social media accounts. 1) In WordPress, go to your Reader, and click on the cog next to ‘Blogs I Follow’ to bring up a list of your subscriptions. Click on ‘Export’. You’ll be prompted to save the export file (.opml). 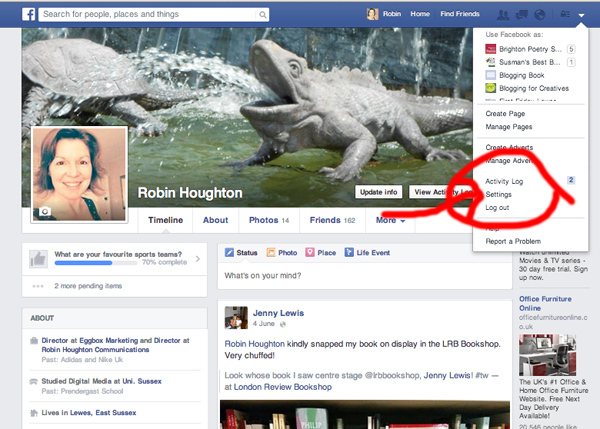 You’ll then be prompted to add a Stream to that tab – you have a choice of Networks, Apps or Shared. 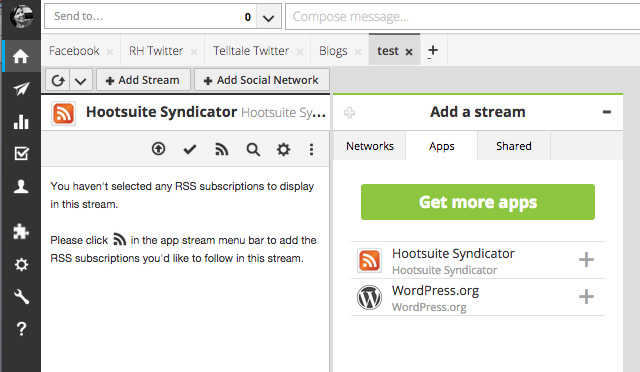 Select Apps, and click on Hootsuite Syndicator. If you don’t see that as a choice, click on ‘Get More Apps’. 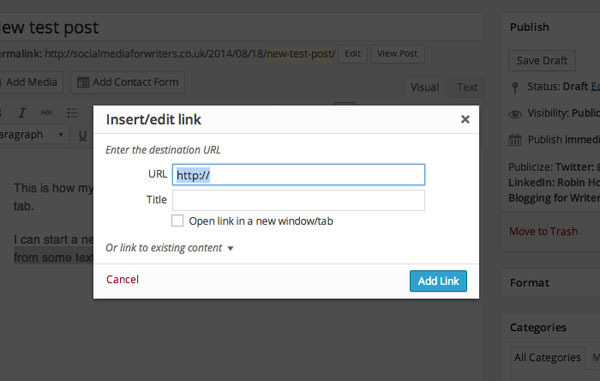 You can then search and install Hootsuite Syndicator (it’s free). 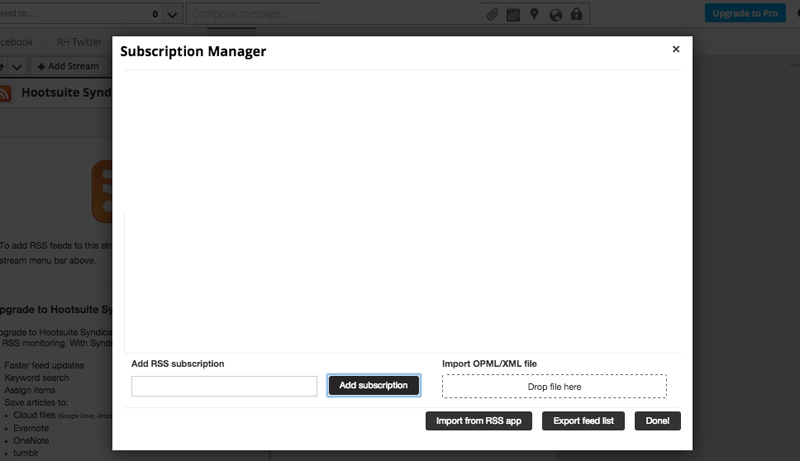 3) Under Hootsuite Syndicator, click on the RSS icon and you’re into the Subscription Manager screen. 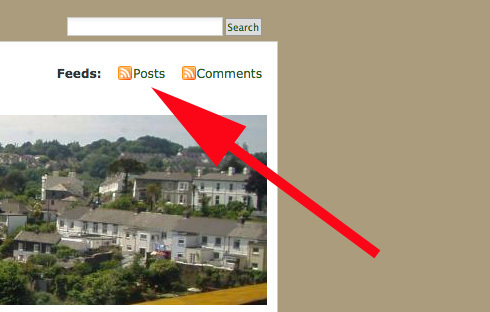 Here you can either add individual feeds, or import a number of feeds. Do this by dropping in your .opml file. 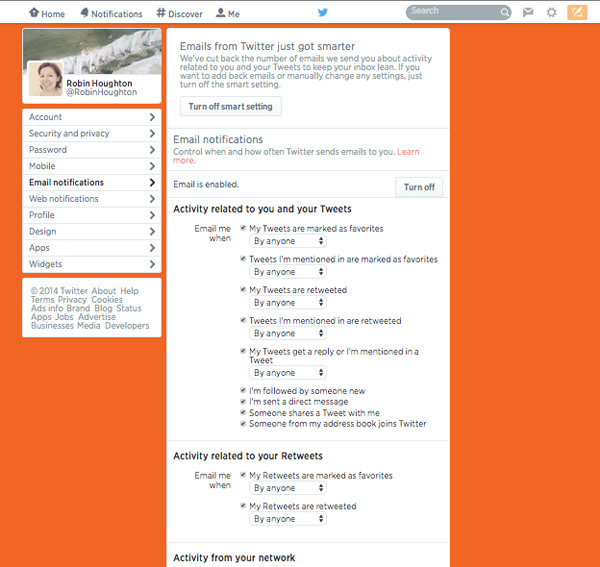 4) If you have a lot of feeds to import it may take a few minutes, but eventually you’ll see all your feeds appear. 5) Close the Subscription Manager, and you now have a ‘Blogs’ tab alongside your Twitter, Facebook or whatever you have … where you can skim through new blog posts and read them at any time. I’d like to be able to read blog posts from my phone, but sadly it seems that Apps streams aren’t viewable on the mobile app version of Hootsuite. However you can read them on a tablet in a web browser. When I find a new blog I want to subscribe to, I now look for the RSS icon, rather than just hitting ‘follow’ or ‘follow by email’. When I click on that, a box comes up inviting me to add the feed to my Hootsuite (you have to be logged into Hootsuite for this to happen). 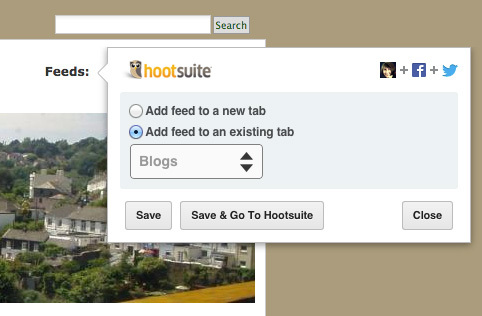 I then select ‘add feed to existing tab’ and choose ‘Blogs’ – and the blog is added to my Blogs stream in Hootsuite. Done! You’ve probably seen them around the web, on blogs, forums and author profiles – those little images next to people’s names. They’re called avatars, and they’re applied automatically whenever you post or comment. The good news is you don’t have set up your avatar again and again on every blog and media site you encounter, because the majority of them display the results from one place – Gravatar. Gravatar stands for ‘Globally Recognised Avatar’, and it refers both to the individual icon itself (your Gravatar) and the site where you create one (Gravatar.com). As with most web apps, there’s no guarantee Gravatar will be around forever, but for the moment it seems to be stable and it’s recognised as an industry standard. Which is why I think it’s worth your while setting up your Gravatar if you haven’t already. If you’re anything like me, you put a low priority on things like filling out your profiles, uploading profile images and keeping things up to date. There just seems to be too much else to do. But once you’ve set up your Gravatar you can kind of forget about it. Nobody wants to be a grey, mystery man! As you post comments on blogs, and are joining in conversations on the web, you want people to remember you. Research has shown that showing your face creates greater levels of trust, more shares and more interaction. Anonymity is too often associated with having something to hide. There’s nothing for it but to get yourself a decent Gravatar and join the people with faces. Getting a Gravatar is simple and best of all it’s free. Signup at Gravatar.com, upload a photo – I always recommend a good, clear headshot – fill in a short profile, and really that’s it. 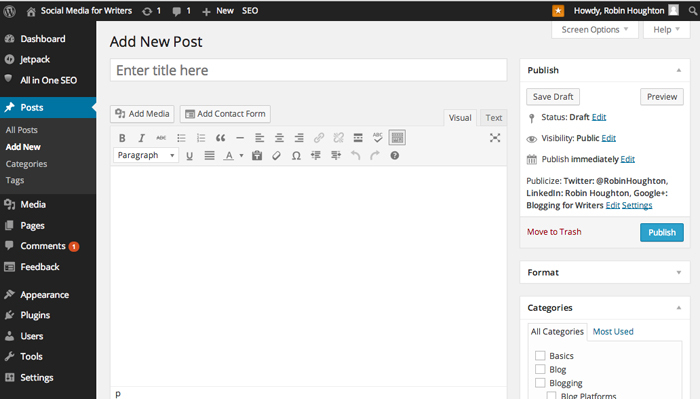 Most WordPress themes already come with Gravatar integrated (which means Gravatars will be displayed with your readers’ comments). But Gravatar is used on many, many sites, not just WordPress. You can see Gravatar in action in the foot of this post – I’ve installed a plugin called ‘Author Bio Box’ which displays your Gravatar information at the end of your blog posts. This is particularly good if you have guest bloggers or if there’s more than one of you running your blog. You can change your Gravatar if you wish, but sometimes it takes a while to see the changes across the web. Try clearing your browser’s cache too, especially if you use Chrome, as Chrome sometimes keeps loading old versions of Gravatars even after you’ve made changes. If you’re interested in how to build trust online there’s a ton of great stuff that’s been done in this area. Take a look at this blog post on Social Media Examiner, or read Chris Brogan’s book Trust Agents. As writers, we’re probably fussier than most when it comes to how our words look on our blog. Typefaces, character- line- and paragraph-spacing, font size, margins and indents are all important … and that’s before we even get into poetry with all its particular forms and layouts. 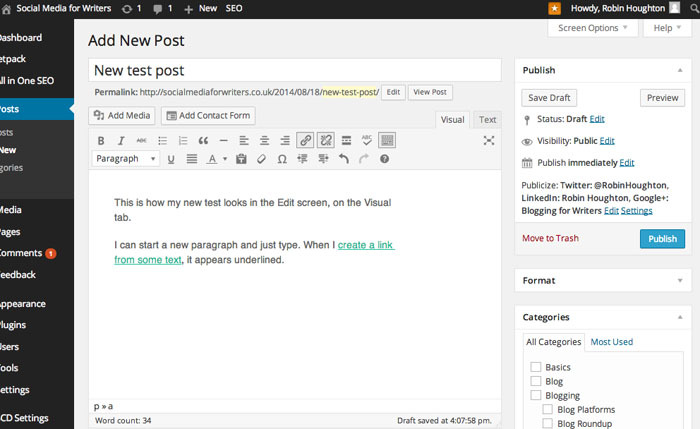 First of all, here’s a basic primer in getting text the way you want it to look, how to add links and tips on formatting in WordPress, using the standard Edit screen. Click on Create New Post and you’re in the Edit screen. Type something in the Title and Body boxes. When you hit the ‘Return’ key you automatically start a new paragraph. Now, with your cursor highlight some text you want to make into a hyperlink, then click the ‘link’ icon in the menu bar (looks like a chain). Many of the icons on the formatting menu bar will be familiar from word processing programs – underline, bold and lists, for example. Others you should explore to see what they do. Particularly useful is the paragraphs styles drop-down menu. Highlight the text you want to make into a subhead, for example, and then choose one of the Headings sizes. Your Theme will have styles assigned to each of these, so try one or two out and see how they look. The sub-headings in this blog post are ‘Heading 3’, for example. Just remember – you first have to highlight the text you want to format or make into a link, then click the relevant icon. There are other things you can change with the formatting menu, such as font colour, but just be aware that this will override your Theme’s styles and can end up looking messy. I would also avoid the ‘underline’ function, as this always causes confusion as to whether or not a word is a hyperlink. Basically have fun experimenting – you can preview any changes and you can delete or amend anything, even after publishing. 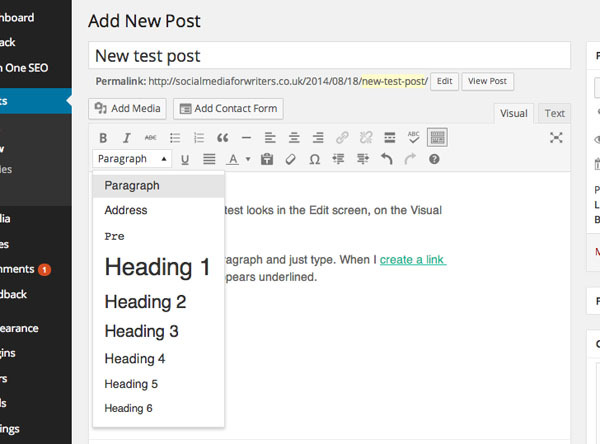 WordPress has always had a slight issue with text that’s been formatted in word processing software (such as MS Word). 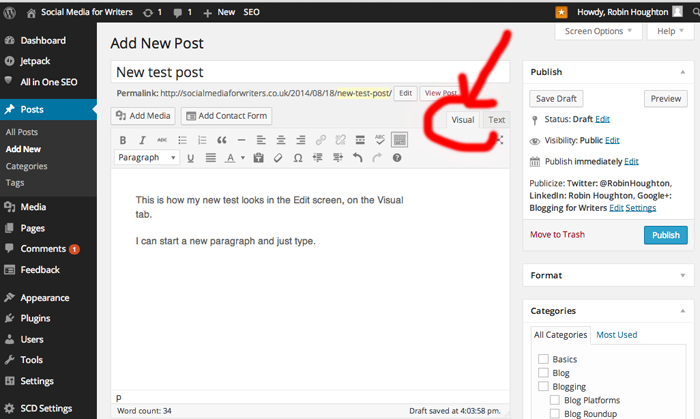 It can mess up the formatting if you post directly from a Word document into the Edit Screen while in the Visual tab. There’s a more detailed explanation of this here. Historically, the ways around this were either to click on the ‘Paste from Word’ icon in the Formatting Menu (which works sometimes but not always), or to paste under the Text tab (but this means you have to re-do ALL the formatting), or copy your Word document into a plain text program such as TextEdit or NotePad, THEN paste into the Edit Screen. Tedious! However, WordPress 3.9 (April 2014) claims to have solved the issue – yet another good reason to keep your version of WordPress up to date! Want to make more changes? 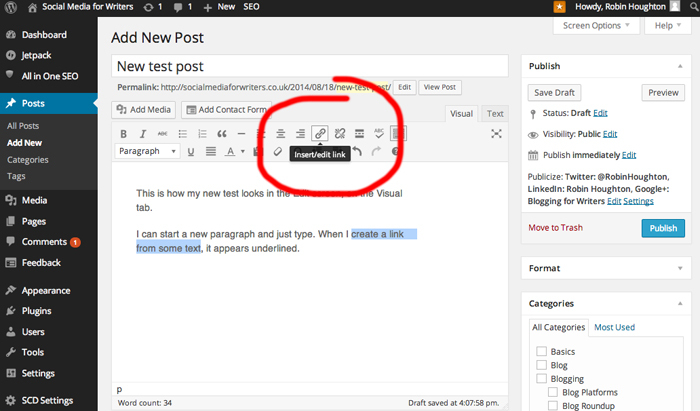 If you want to make changes beyond what you can do in the Edit screen, then the means available to you depends on whether you have a hosted blog at WordPress.com, or a self-hosted blog. First of all, many decisions about fonts, spacing and the like are dictated by the styles of your chosen Theme. Themes do allow a certain amount of customisation, but it’s unlikely to be more than logo and colour schemes. WordPress.com: If you (or someone you know) understands code, and is capable of making changes to the styles, then you can buy the Custom Design upgrade for $30 per year (per blog). This gives you access to the CSS (Styles) and the world is your oyster. Self-hosted WordPress: You (or your techie help) have full access to the code and can make changes to the CSS at any time. 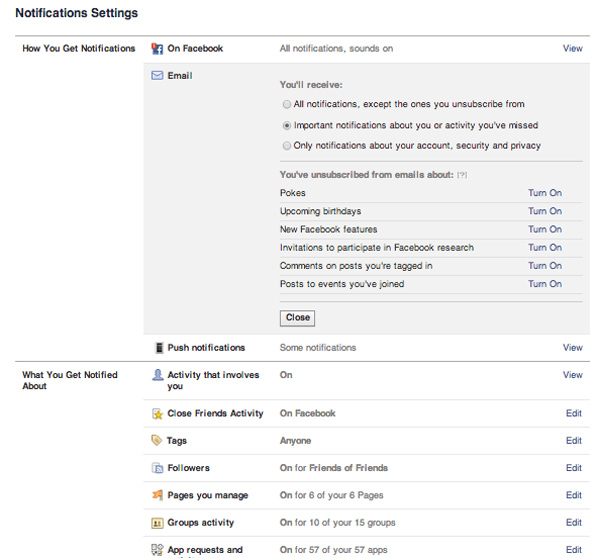 But a less scary option might be to install pugins for whatever it is you want to change. A plugin is a piece of ‘add-on’ software that someone has already configured, so you don’t have to get your hands dirty. For example, if you want to choose from a larger range of fonts, you could install the free ‘Easy Google Fonts’ plugin. There are millions of plugins for just about anything you want to do on your blog – access the Plugins Library from your Dashboard side menu, click the ‘Add New’ button and search by keyword. Be sure to read about the Plugin before installing it. Anyone can create plugins and they’re not all great, so check to see how many people have downloaded it, how many ‘stars’ it has got, how recent is the latest version. The best plugins are those that are kept up to date and actually work.